Office 365 groups expiration policies allow administrators to set an expiration timeframe for any Office 365 group. Once that timeframe is set, owners of these groups get notification emails reminding them to renew these groups if they still need them. Groups not renewed will automatically be deleted. Starting today, this feature is now Generally Available! We’ve listened to your feedback and made it even more intuitive for users to decide whether they want to renew their group. The newly redesigned notification emails now provide one-click access to the group content, and also allow the group to be deleted if it’s no longer needed. Office 365 groups expiration can be configured from the Azure Active Directory portal, as well as programmatically via Azure Active Directory PowerShell. 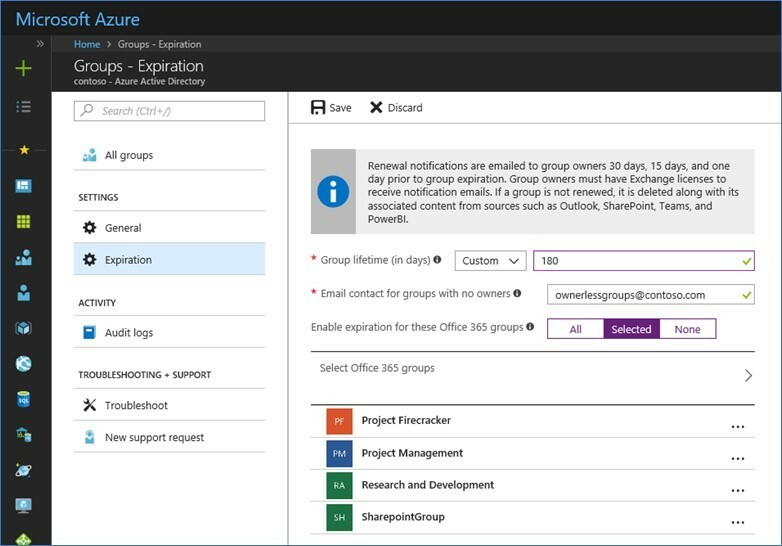 Learn more about how to configure Office 365 groups expiration. For more information head over read the full announcement by Alex Simons over on the EMS Blog. The Office 365 groups expiration policy feature will require an Azure AD Premium license for every user who is a member of an Office 365 group configured for expiration. Visit Office 365 Support for more licensing details. Sometime people doesn’t care about email. is there any way to retrieve this data after 30 days of deletion? We enabled the group expiration feature. On one of the emails that we received, we had the option to "Delete this group now" (rather than waiting 30 days for it to expire). This feature did not work, it gave a message that said something like "this feature is not yet available." Is there an ETA on the 'delete now' feature? This is good addition including some general features. @Tom Batcheler Thank you for the clear explanation of this feature. I do still have one question however after looking through all the support material for this. Is there a way to enable this setting for all sites, but selectively OPT OUT certain sites? I can assume that if we left the default set to ALL and if I turn off a site with PowerShell that the ALL setting may override my change. I cannot effectively test this on my own since I do not have Azure Premium in any of our dev environments. The use case we are trying to solve is to have like 40 sites we want to not have this policy applied to and then every other site created in the environment we do want it on for by default. Can we have multiple Expiry Policies for O365 Groups or can we increase the 500 Group limit ?